Fancy three practical tips that will guarantee you engagement on your Facebook page? Of course you do! I’ve created a 35 minute webinar that is module from my ‘How To Make More Engaging Content‘ course. The subject of dealing with negative social media comments crops up in almost every communications training session I run, so I wrote a guide with simple dos and don’ts to make things easier: ‘Dealing with negative social media comments‘. And also, there is a flowchart you can print: The Guide to Answering People on Social Media. When everyone’s throwing work at you and you’ve gone into reactive mode as a team – it can be easy to lose heart and feel knackered. 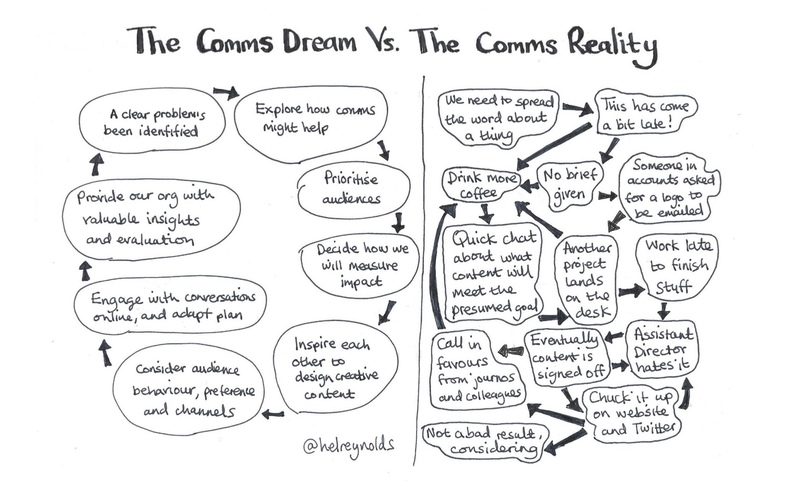 Remind yourself of your awesome role, and inspire yourself to push for amazing comms with The Comms Manifesto. But sometimes you just have to laugh. Play Comms Facepalm Bingo and watch those annoying requests turn into a full house! I’ve listed the things that should be in your kit bag. Check you have all the essential equipment for your job. And remember: never be Windows. For creative comms advice and inspiration straight into your inbox.